Or perhaps you're rebuilding a classic Travel Trailer or motorhome...one of the beauties of yesteryear, names like Airstream, Spartan Winnebago or Silver Streak. 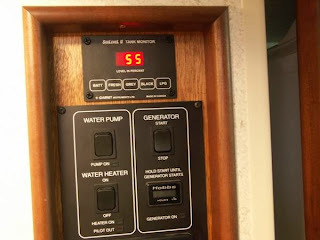 Many of the older RV's didn't have holding tanks at all, and it's one of the most common additions during a restoration. So why not add a tank monitoring system during the tank installation, making the system on your classic coach as convenient as high end RV's rolling off the assembly line? Fortunately, the Seelevel Tank Monitoring System - the same system being put in today's luxury coaches - is available for retro-fit applications for the do-it-yourselfer. In many existing units, adequate wiring may already be in place to add the sensors. In new holding tank system, a simple planned addition to your wiring schematic is all that is needed. Multiple systems are available from Seelevel, depending on your tank configuration. Sensors can be placed on one or multiple tanks with labeled, easy-to-read tank levels on the control panel. Unlike earlier monitoring systems, external sensors are placed on the tanks, eliminating the earlier internal probe systems, which sometimes had difficulties with fouling and corrosion. Seelevel systems deliver readings in percent to full or empty eliminating the guessing that goes on with quarter, half and three-quarter tank monitoring systems. There are even systems available for the low-profile tanks with depths of less than six inches, often preferred by vintage enthusiasts who are trying to preserve the original profile of their camper. And since holding tank spills can be messy and a ruined vacation, the addition of a tank monitoring system should be considered preventive maintenance. So, before you decide to trade in, do without, or close up the belly-pan on that project trailer or motorhome, consider a state-of-the-art upgrade and add a tank monitoring system. Our customer service staff can give you installation advice and help you choose the correct SeeLevel System for your particular situation. Be sure to contact us to discuss how adding a Tank Monitoring System to your coach will keep your older or vintage recreational vehicle up-to-date and user-friendly.